SAINT PETER— Following weeks of widespread anxiety and underpreparedness for the impending disaster of final examinations, President Rebecca Bergman has canceled the remainder of the fall semester and declared an Emergency State of Christmas over the entirety of Gustavus Adolphus College. The president’s executive order mandates that “effective immediately, all outstanding academic work is set to maximum potential credit value, and all scheduled examinations are canceled.” The closure has been described as a desperate, but effective, attempt at top-down response to a looming threat. 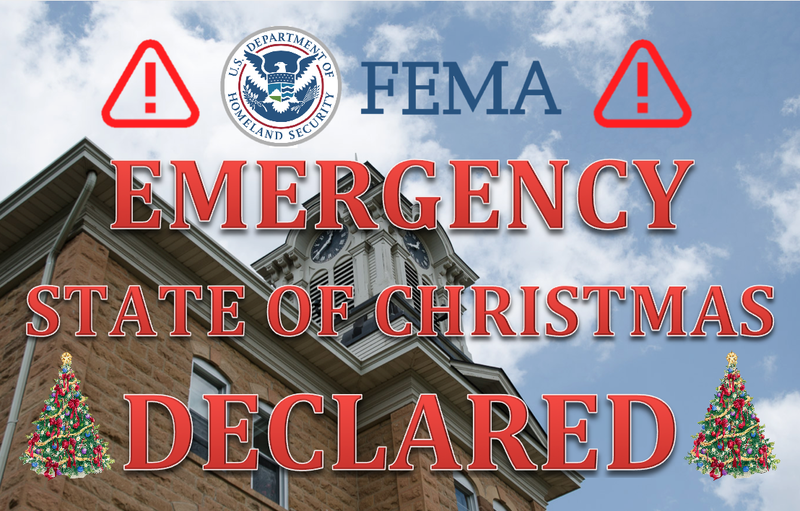 Following the presidential order, the Federal Emergency Management Agency (FEMA) quickly dispatched a task force to the Gustavus campus to distribute emergency Christmas supplies including ugly sweaters, cookies, and 48-hour Netflix trial cards. FEMA operations, under the mission name CLSTRFK Down, also include the tasks of incinerating any and all academic supplies, and promptly relocating students to their homes far away from the site of the projected disaster. In addition to FEMA’s logistical support, an elite team of 16 heliborne Navy SEALs (DEVGRU, or Team Six) was airdropped onto the roof of Olin Hall to rescue an unknown number of students (codename: PHYSMAJ) imprisoned on the building’s second floor. SEAL Team Six escorted the PHYSMAJ captives out the front door of the building with remarkable speed. The exit velocity of these freed captives was, incredibly, the same as the maximum speed the PHYSMAJ would have experienced had they had simply jumped out the second-story window. This mission, codenamed Torricelli’s Rescue, has been widely praised for its dynamic fluidity. In response to this concern with latent damage due to the mere threat of final examinations, President Bergman has pledged to look into a student demand for a 90% tuition cut, free alcohol in residential halls, and a new academic department of Netflix Studies. 5 Ways Gusties Are Sticking It to The Man!